Welcome to summer, when the temperature in the city reaches its peak. When you’re west of LI without a beach in sight, beat the heat like a true insider. Several hotels allow city dwellers to use their pools, even if they don’t plan to stay the night. 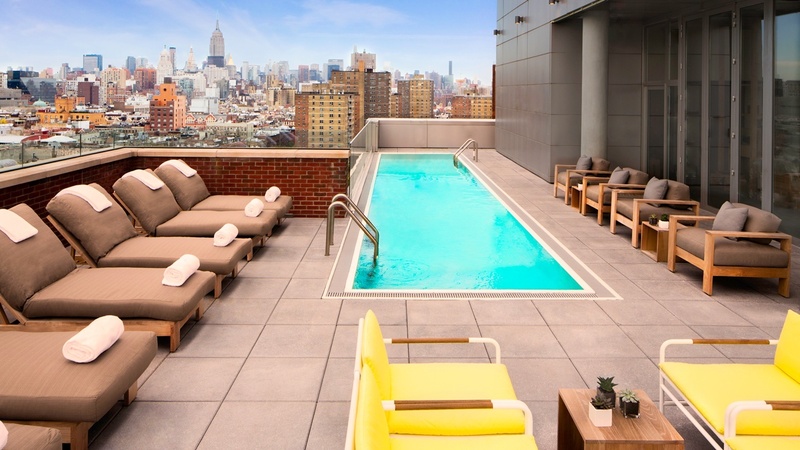 Have a cool, luxurious afternoon by diving into seven NYC hotel pools. The hotel’s 50-foot heated glass-bottom pool is directly above the lobby, creating the appearance of a floating ceiling and an instant buzz for arriving guests. 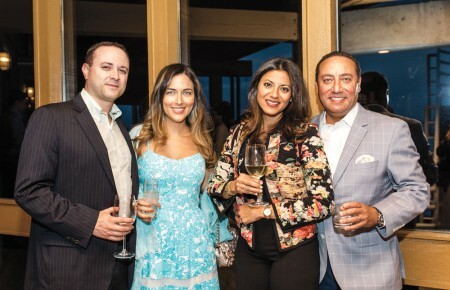 The full-service bar on the 5,000-square-foot deck creates a bit of a buzz for loungers. Day passes are available to the public for $60, Monday-Friday from 11am to 5pm, based on availability. 355 W. 16th St. Go. 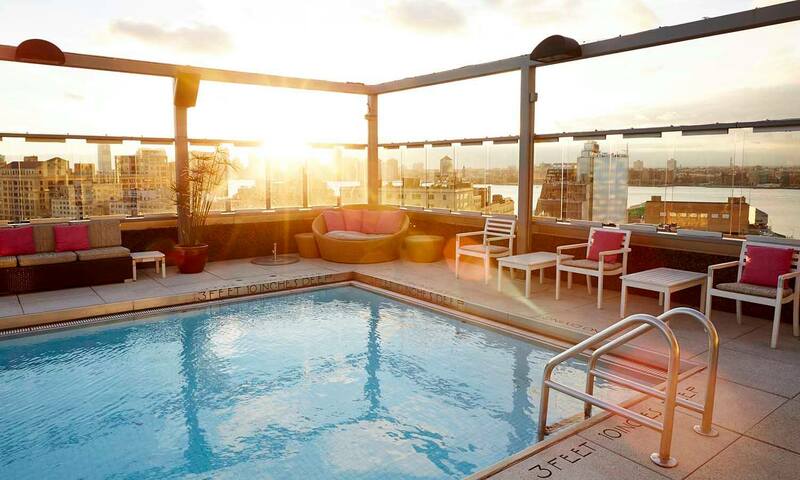 Play hooky and make a splash in Gansevoort’s heated rooftop pool. From Monday-Wednesday until Aug. 31 Ganesvoort is holding a “OOO” (out-of-office) experience day pass for $250. It includes pool access from 10am–4pm, a pool bed, complimentary towels and fruit. The 360-degree views of the city sure beats whatever is on that work desktop. 18 9th Ave. Go. Hôtel Americano’s rooftop pool and grill La Piscine, the jewel of Grupo Habita’s 10-story hotel, has an Instagram feed to back up its fun and fashionable rep. Forget social media induced FOMO and come out for DJ’d summer pool parties. A $40 day pass gets people access to the pool, popular dishes like the spicy Americano lobster roll and a chance to take in Chelsea from above. The rooftop is open Monday-Thursday, 6pm–12am; Friday-Sunday, 12pm-12am. 518 W. 27th St. Go. Hotel Indigo Lower East Side’s new 15th-floor heated rooftop pool and outdoor bar has a dining terrace alongside eatery Mr. Purple with sweeping views of the skyline. Say “ohm” at rooftop yoga sessions Saturdays at 9am with PURE Yoga. Day passes are available for $50 to lounge on the deck and enjoy cocktails and munchies from the menu. 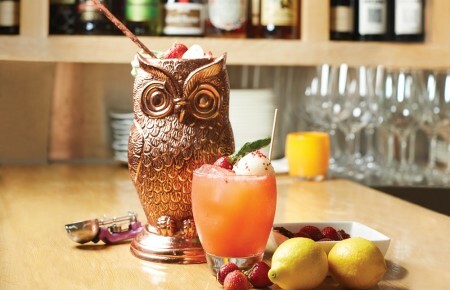 The summertime spice cocktail, made with milagro silver tequila, ancho reyes chile liqueur, agave nectar and fresh lemon, puts a south-of-the-border spin on a summer afternoon. Heads up: Poolside chaises and daybeds are reserved for hotel guests. 171 Ludlow St. Go. 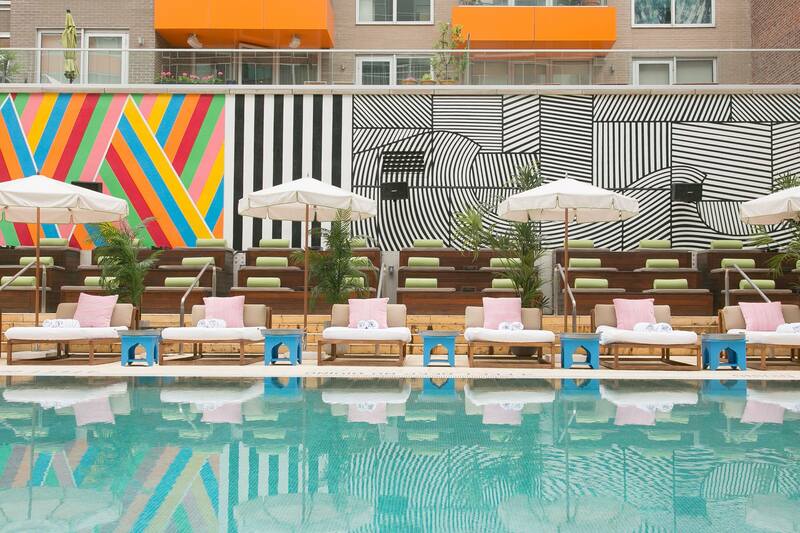 This Williamsburg hotel has an oversized pool in its backyard with a 4,800-square-foot deck that tends to be rocking with live bands and DJs. Day passes (11am-4:30pm) or night swim sessions (5-9pm) are available online 24 hours in advance and includes pool access, towels and WiFi (from $45 weekday; from $65 weekend). 160 N. 12 St., Brooklyn. Go. The 18th-floor rooftop seasonal plunge pool is surrounded by inspiring views of the city skyline. On weekends, the rooftop bar and lounge JIMMY opens to guests and the public at 3pm for JIMMY Summer Pool Parties. Locals looking for a little extra R&R can book morning rooftop meditation sessions from 7:30am-8am, followed by one-hour yoga classes from 8am–9am through Labor Day. 27 Grand St. Go. Dive in at Sixty Lower East Side and see a familiar face: Andy Warhol’s image is painted across the bottom of the pool. Savor summer Sunday Fundays at weekly #SundaySchool pool parties (2pm-8pm), which boast live DJs and pop-up shops that allow guests to stock up on essentials like towels, bathing suits and sunglasses. 190 Allen St. Go.